Quite possibly the most gaijin-proof game ever. Yet so irresistible! Match up Japanese characters on a pattern of tiles to form words, score points and move on. Finding a good puzzle game on the Game Boy Advance is like trying to blow glass: you think it’s going to go okay, but hours of work leaves you with an abstract lump that even a pro can’t discern and a host of second-degree burns. Not that Tetris doesn’t stack up, but 8 bits only go so far these days. Even the long-awaited GBA version of Capcom’s Puzzle Fighter crashes on occasion, making one wonder how things could possibly get worse. Apparently Namco has noticed this discrepancy and given the Japanese public Moji Pittan Advance, perhaps in hopes to give the system’s sagging puzzle genre the shot of Botox it so desperately needs. Originally an arcade game and also available on PlayStation 2, Moji Pittan is a language-dependent puzzler that definitely does not capture the hearts of the world on the same level as Tetris, much less Columns. But depending on where you come from (no really), that isn’t necessarily a bad thing. 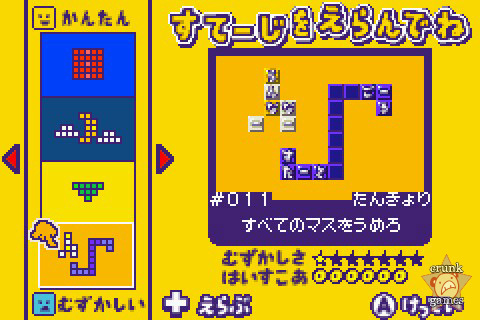 The first thing you see when starting up a stage in Moji Pittan is a board of tiles laid out in some sort of pattern. On the left of the screen is your selection of available character tiles, which you choose, bring over to the board and, if the in-game dictionary thinks it works, form a word to score points. Like in a crossword puzzle, words can only be formed in a forwards manner either right across or down, so trying to cheat by going backwards will get you nowhere. Like other puzzle games, Moji Pittan borrows a few concepts from others in its genre. Shocking, I know. 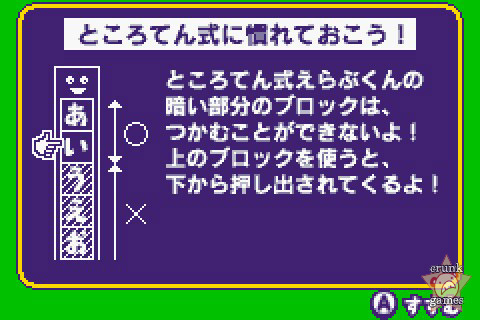 Some stages will allow you to use the entire inventory’s worth of tiles to select from, but others can limit your choices to only a few at a time. 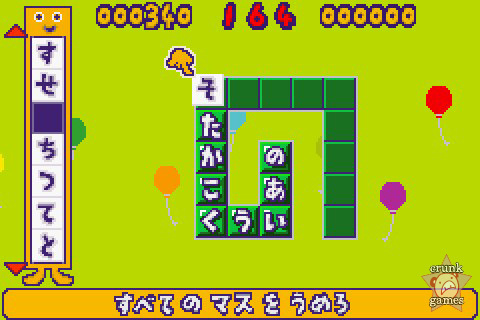 Since all of the tiles are from the Hiragana alphabet, you can easily string up long words to score bigger points. And of course, you can also manage chain combos to raise your self-esteem with. As mentioned, you have an inventory of tiles, but it’s finite. In fact, a good chunk of stages have specific goals like having to form a certain word a certain amount of times and if you don’t meet it, back you go, whacking the R button to recall all your moves. The stages themselves are set up in varying patterns and are in ample supply, some taking part in Namco’s seemingly obligatory nods to its past with stages based on Pac-Man, Mr. Driller and other series. Others have additional challenging elements like rotating tiles or humongous character tiles that you have to base all of your words on. There are three main play modes in Moji Pittan, offering up a diverse (at times eccentric) jumble of stages. 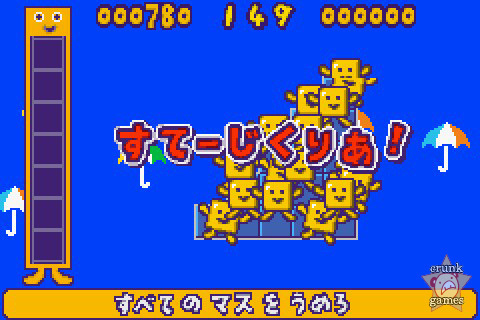 Jikkuri Puzzle mode is the main set of stages, around 300 for you to complete in any order. 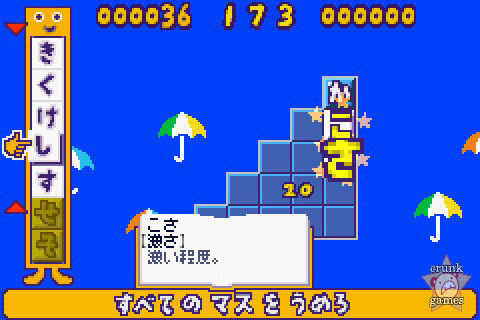 There’s also Arcade, for puzzles that are more dependent on speed and less on strategy. Finally there’s Special mode, with a variety of goofy stages to unlock and be confounded by. As you can see, there’s more than enough fun to be had, but for a GBA game, a GBA puzzle game mind you, there’s a bemusing lack of any multiplayer mode in Moji Pittan. Even the PS2 version manages support for 2 players! I think it’s obvious that this is quite a disappointment. Regardless, the game has some pretty good music. So what if you stopped caring; Moji Pittan has a healthy selection of peppy tunes that evoke fond memories of childhood where the best of us would record NES music onto our dad’s portable tape deck. The main menu features a light-hearted melody that would fit perfectly as a sitcom theme song, and the aforementioned retro Namco stages provide some catchy remixes of each old game’s main tune. In addition, Namco denied the limited power of the GBA and even put in a couple of vocal themes. They might not be J-pop classics, but that’s actually what makes them so enjoyably funny to listen to. The music’s even made an imprint on Namco’s traditional drumming game Taiko no Tatsujin, so our opinion simply can’t be a fluke.